Fancy showing other people how to play a blockbuster game on YouTube? Would you like to create instructional videos to teach or train something, or communicate some computer issues? If you are in this league, it can get a bit frustrating when you have difficulty in getting your point across to your audience. And what you need is to record the sequence of actions in a video, so that anyone can figure out your point. The free screen recorder for Mac absolutely a solid choice to make the process of creating lessons, tutorials, product reviews, and even presentations a lot easier on Mac OS. And here are 10 excellent best screen recorder for Mac options available completely free. The first free screen recording software for Mac we'd like to show you is the built-in screen recorder of MacX Video Converter Pro, which is able to free record screen on Mac with audio. No matter you're willing to record software training sessions, game walkthrough, demos of apps, presentations or streaming videos playing on YouTube, this screen recorder for Mac will suit all your needs on Mac screen capture with the help of system audio, microphone. Besides, as the name implies, the screen recorder for Mac free with audio is also known as the best video converter for Mac, allowing you to convert the recorded video to MP4, AVI, MOV, MKV, H.264 or any other formats so that you're free to watch your Mac screen recording on iPhone iPad Android or uploading to YouTube. Free download the free screen recorder for Mac and launch it. And if you plan to capture Windows screen actions, grab the Windows version. 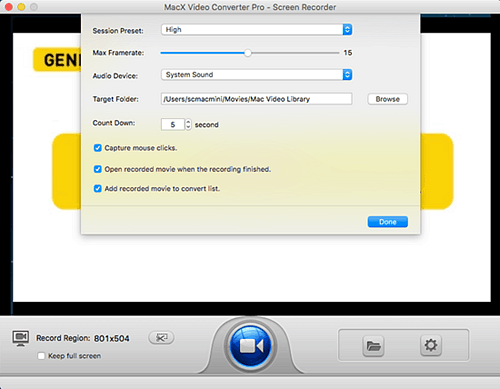 Step 1: Click "Screen Recorder" icon on the main interface to get ready for Mac screen recording. 1. Choose the Session Preset and move the Framrate slider to determine the quality of the recorded video. 2. Go Audio Devices and click on the drop-down button to choose "System Sound". 3. Set the output folder to save the file from the Target Folder. 4. Check the box of "add recorded movie to convert list" if you'd like to convert your recorded video later. 5. Back to the main interface, crop the specific area of the screen to record or simple check Keep full screen if you want to record full screen video on Mac. Step 3: Hit Record blue button, then the free screen capture for Mac will capture what is happening on Mac OS. 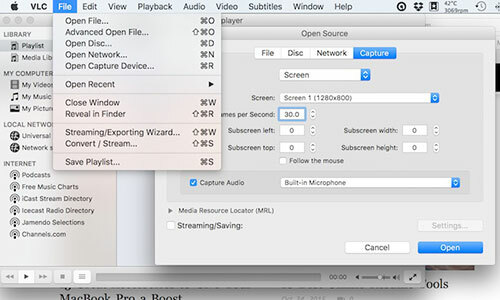 The video captured by this free screen recorder for Mac is in MOV format by default. If you wanna watch your recordings on iPhone iPad Android devices, or upload them to YouTube, Facebook, Dailymotion etc., you can convert MOV to MP4 on Mac, or any other compatible formats with the all-round MacX Video Converter. Jing is a free screen recording software for mac that not only allows you to capture images, but also record videos. 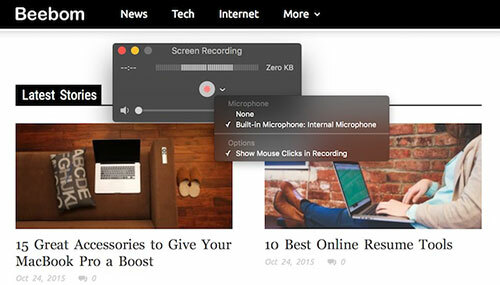 Simply save any particular area into a screenshot and continue performing a video record with the same selection. This app will allow you to use the microphone during recording. But it's a pity that if you use a mic, you cannot record the system sounds. Anyway, if you want to narrate through some process or guiding steps, this software is the right one for you, not to mention it's available to record 360 degree videos, 4K UHD videos etc. History feature that allows you to see you recent recordings. Tend to lag from time to time. A surprise, as a Mac user, you obviously know that QuickTime Player comes as a default video player for Mac, but seldom to know its capability of recording Mac screen for free. Well, if you need a no-nonsense solution for your screen recording needs which caps at 15fps, can record microphone audio but not system audio, and doesn't need your face to be shown in, and doesn't need you to install anything or spend a single penny, QuickTime is the right answer for you. The recording can only be limited by the space available on your hard drive. It can't play two videos simultaneously. It doesn't support other video formats. Coming from the same developers that brings us the excellent Jing, Snagit is another free screen recorder for Mac that will help you to record high quality videos. 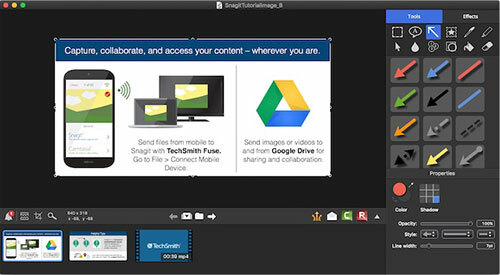 The focus of Snagit is on annotation of your screen captures - both in stills and video formats. And better still, the Mac screen recorder, available on OS X 10.9 or later, will retain what you have recorded, allowing you retrieve them at any time. Easily retrieve the recordings given that they are stored in the tray. It features a user-friendly interface. 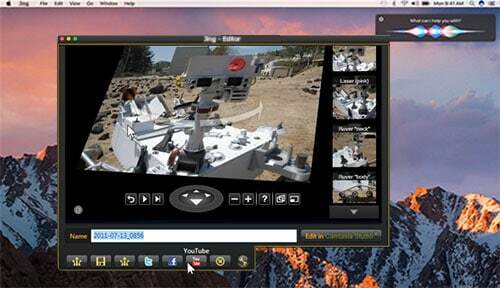 It provides an option of using keyboard shortcuts to start the process of recording. One of the most unique features of Monosnap, other than it being available for a number of platforms, is that is records your screen in 60fps for an ultra-smooth playback even in the most demanding scenarios. The free Menu bar tutorial, presentation, gameplay recorder also comes with option of turning on your webcam, mic and system's audio all at the same time before you start recording. If you are connected to your Monosnap account, once you're done recording, you can immediately upload and share the link with your friends. Allow you to use the system audio, webcam and mic simultaneously. Allow you to hide private information. You will need to register a Monosnap account. As one of the best free Mac screen recorders, TinyTake certainly allows you to record video from iMac camera, but you will need to sign up for a TinyTake account. Once you have installed the Mac screen capture, it shows up in your menu bar. As you get started, you can record anywhere from two minutes to two hours, and you can even make notes or point things out on screen. It's worthy to praise that the TinyTake can be treated as a YouTube screen recorder as well, not only being capable of recording YouTube on Mac, but also uploading your video directly to YouTube. You need to sign up a TinyTake account first. You might be surprised to find VLC here, after all, it's merely a video player. Actually, VLC can meet the basic screen capturing for most people. To access this "hidden" feature, navigate to the File menu and Open Capture Device, where you need to change the source selection to Screen. VLC allows some basic adjustments like which audio input device to capture, what frame rate to use for videos (up to 30fps), and allows following the mouse for easier focus as well, among other parameters. Works on every platform VLC is available on, on Windows, Mac, and Linux. Installed by default for many Mac users, no need for any extra tool installations. A bit complicated compared to other free screen recording software for Mac. Only available to record the complete desktop, cannot change the recording's resolution. 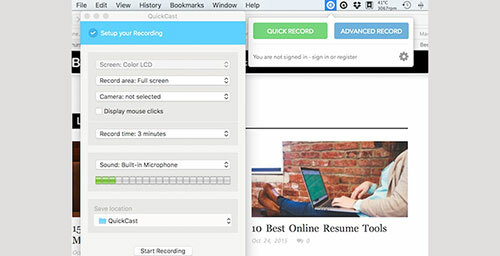 Quickcast is another incredible app that any Mac user can use to record Mac screens for free. 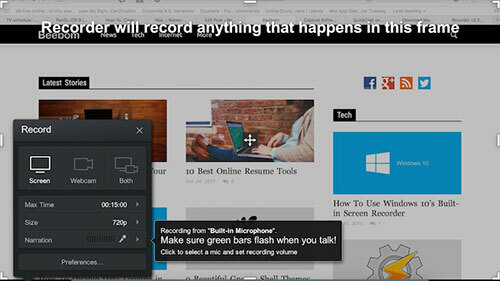 This free app is very fast and allows you to share your screencast via a QuickCast portal. And the videos recorded by the free screen recording software for Mac are also available to embedded to Webpages and blog posts. 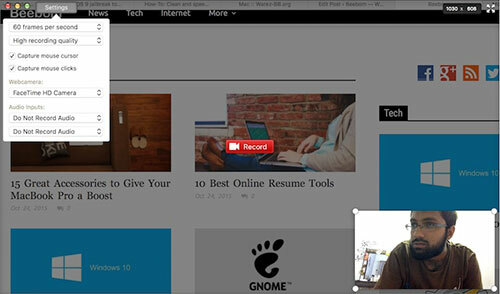 Allows you to easily share your screencasts. If you're a keen gamer, OBS Studio is easily the best free screen capture software for you. 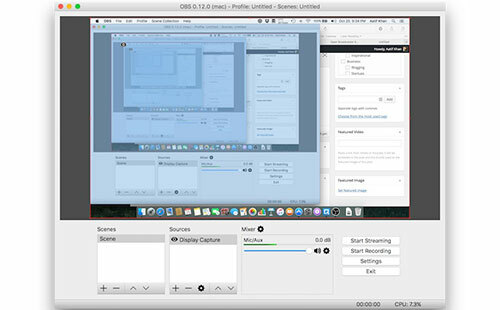 Unlike the hugely popular FRAPS, OBS Studio is open source, and completely free to use without restrictions. It supports both streaming and recording in high definition, with no restrictions on the number or length of your creations. With this free game recorder for Mac, you can stream live to Twitch or YouTube's gaming, save projects and come back to them later, or encode your footage in FLV format and save it locally. It is easy to use. Available for live streaming. Screencast-O-Matic is free to use, but also offers a paid version for $15 per year, which is pretty reasonable. 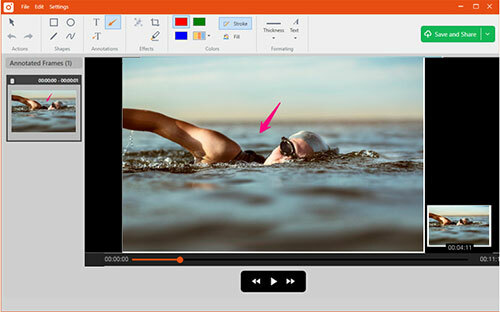 The free version screen recorder lets you record for up to fifteen minutes, does screen and webcam recording, allows you to publish to YouTube, and saves your recordings as video files. That concludes all the top 10 picks for Mac screen recording software. We took care in compiling this list that pretty much all category of users can find something that works for their specific need. Or if we've missed your favorite screen recording software on Macbook Pro/Air, iMac, let us know in the comment. Free download the best free screen recorder for Mac - MacX Video Converter Pro to easily record screen with sound on Mac and convert the recorded video to MP4, MOV, H264, MPEG4, MKV, AVI, FLV, etc for playing on iPhone, iPad, Android or uploading to YouTube .